There is no subject more complex these days than school safety. 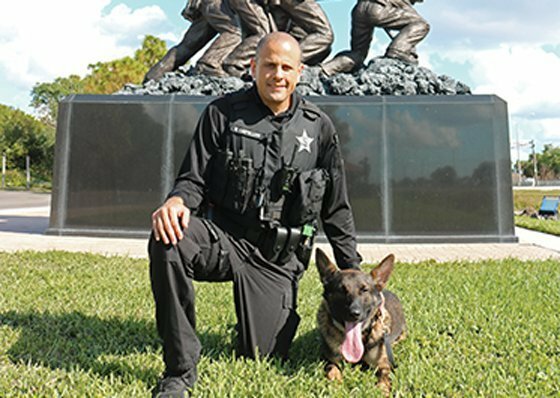 With potential threats on schools becoming more prevalent, the Lee County Sheriff’s Office in Florida recognizes just how important and resourceful police dogs are in assisting law enforcement and keeping communities safe. How important? This is where K9 Kylo and his handler, Deputy Richard Castellon, come in. Together, they are leading the way in a unique approach to school safety and easing both students and teachers’ concerns by walking the halls right beside them. It may sound contradictory given that Kylo’s main objective is to detect narcotics at schools, but his role is making a much bigger impact on the Lee County School District and its 67 schools county wide. The Lee County Sheriff’s Office is the only agency in Southwest Florida to have a K9 dedicated to the Youth Services Division. With more than 93,000 students in the Lee County Public School system, Kylo, a two-year-old German shepherd from Holland, and Dep. Castellon, a 14-year veteran in law enforcement, are an instrumental part of providing security and safety.